Enjoy! And feel free to comment and provide feedback. New additions to the image gallery! A sneak peak of upcoming features such as ambient occlusion as well as screenshots from the just released 0.9.6 version were added to the gallery. Check it out! This also works on (some) android devices and within a WebGL context. We released binary builds of UnityMol version 0.9.6. They are available from the sourceforge download page https://sourceforge.net/projects/unitymol/files/UnityMol-0.9.6/. Builds are available for Mac OSX, Windows and Linux. UnityMol on twitter and on gitter! UnityMol is now on twitter! 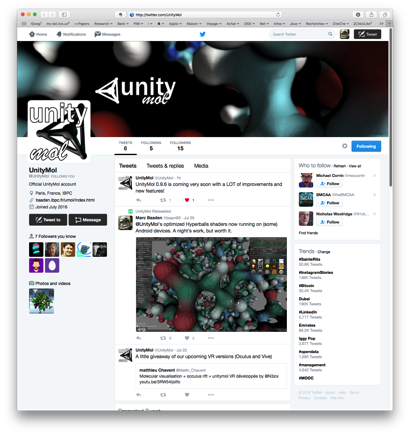 Check out the twitter page either from the link in the sidebar to your left, or directly from http://twitter.com/UnityMol. There is also a chat room available on gitter. Long overdue, the website was updated and the latest news was added. The UnityMol developer doc was updated. 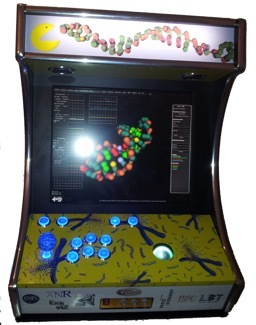 DocMolecules and our Arcade machine together obtained the iGamer 2015 Student/Research/Academic prize from the public. Great! See iGamer Tweet and final photo, or the news from our colleagues in Rennes (in French, though). Doc Molecules was conceived for an Arcade machine with a haptic arm enabling a touch sensation to construct molecular assemblies. By exploring the mode of action of a drug that is frequently prescribed to combat allergies, the DocMolecule player moves his way up through visualisation and manipulation of molecules. 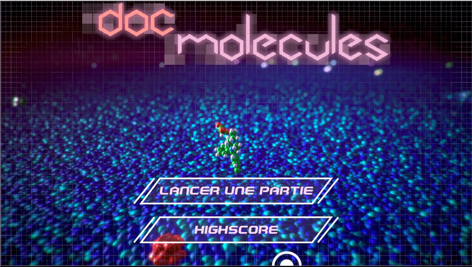 DocMolecules is a combination of UnityMol and Biospring, a physical simulation engine designed for research purposes and reused here to dock molecules together and score the player's achievements. DocMolecules is a joint project coordinated by Espace des Sciences in Rennes, together with University of Rennes and Polymorph software. We provided the underlying softwares, both UnityMol and BioSpring, as well as scientific advice. 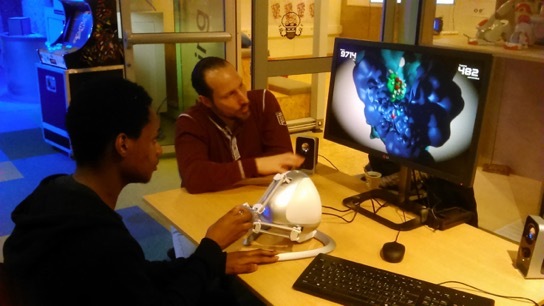 In the HiRE-RNA Contest, participants are asked to manipulate RNA structures interactively. These molecules are found in living cells, are very similar to DNA, but perform other functions. Run Molecular Dynamics Simulations at home, pull atoms and discover how these molecules behave and carry out their biological function by means of a molecular visualization software: UnityMol. Participants submit their simulated RNA structures that are evaluated and scored based on energy calculations through our website https://hirerna.galaxy.ibpc.fr. At the 1st International Workshop on Virtual and Augmented Reality for Molecular Science (VARMS@IEEEVR), 2015 IEEE, we presented a general software architecture to carry out interactive molecular simulations in a game engine environment. Our implementation is based on the UnityMol framework and the HireRNA physics engine. With UnityMol, we pursue the goal to create an interactive virtual laboratory enabling researchers in biology to visualize biomolecular systems, run simulations and interact with physical models and data. Similarly, UnityMol enables game designers to build scientifically accurate molecular scenarios. We discuss four case studies, from simulation setup via immersive experiments, force-induced unfolding of RNA to teaching and collaborative research applications. Visual effects enrich the dynamic and immersive aspects. We combine an appealing visual feedback with a set of analysis features to extract information about properties of the fascinating biomolecular systems under study. Access to various input devices enables a natural interaction with the simulation.